A clipboard for 21st century medicine? An electronic clipboard that has the potential to save lives has been unveiled. It is hoped the device - known as a mobile clinical assistant (MCA) - will cut the time doctors and nurses spend on paper work. It could also improve patient safety and speed up treatment times. The portable device lets clinicians access patient records at the bedside, write notes and order essential tests in real-time. One senior doctor described it as one of the "most exciting developments in my 25 years in medicine". The clipboard, which resembles a modified tablet computer, has been developed by chip maker Intel and Motion Computing. Over the past two years the firms have been working with NHS staff to refine what the device can do and include features requested by doctors and nurses. 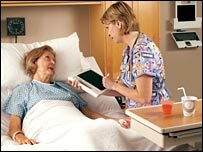 The MCA has been toughened to cope with hospital life and can be disinfected to help keep it free of bugs that could cause infections. Onboard it has a scanner that can read RFID (radio frequency identification) tags that allows nurses to log on to the system securely and quickly. It also has a barcode reader built in so it can read drug labels and patient wristbands and a digital camera to take pictures of wounds. "From a clinician's point of view this is one of the most exciting things to happen in my 25 years in medicine," said Dr Mike Bainbridge, a senior clinical architect for the NHS. He estimated that using the machine could cut mistakes made when administering drugs by up to 70%. Paperwork and errors cost the NHS dear each year. Medication inaccuracies account for 40,000 lives each year while the cost of administration is a whopping 6.4% of the UK's GDP. In tests at the El Camino Hospital in Northern California doctors saw a 30% reduction in the number of medication errors over a four week period, said Pat Perry, vice president of Intel's Digital Health Group. "This is an example of the correct tool for the job and it will make a significant difference to how medicine is practised over the next two to five years," said Dr Bainbridge. He hinted that the NHS would be ordering the device - which is selling for £1,199 - in bulk, although he could not give a timeframe or details. "We anticipate that there are 300,000 practitioners online at any one time in the NHS. How many will need one? Between 50 to 100%," he said. There will be limitations on the roll-out of the devices. The MCA needs a wi-fi network in place to be able to talk to a hospital's main database - one of its most vital functions. Dr Bainbridge did not know how many UK hospitals have widespread wi-fi networks. 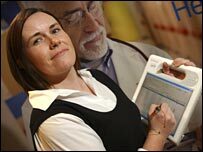 The hi-tech clipboards work best when they can access and update accurate patient records. The NHS is currently involved in a huge project to unify patient records on one database. This records plan has generated controversy among many GPs with many joining privacy advocates to express concerns about confidentiality and which other agencies will have access to them. The MCA has been on trial at the Salford Royal NHS Foundation Trust in Manchester. Staff nurse Jenny Quilliam was impressed by how it improved her job. "I was quite sceptical at first but after five minutes I found it really easy to use," she said, admitting that it was prone to frequent crashes. But, for her, the benefits outweighed the problems. "It allowed me to look up test results, make referrals and get test results to patients quicker. "If I ordered a blood test it would instantly flash up on the phlebotomist's screen. It meant they weren't waiting on getting it from the ward computer at the end of the ward round," she said. Mike Frayne, director of operations for critical care at Salford Royal, estimated that such a quick turn-around could save up to half a day in terms of test results, as well as improving communication between colleagues. "Quick diagnosis means quicker treatment for patients," said Ms Quilliam.